The successful consultative pay ballot of members demonstrated 82% rejection on a 48% turnout and 65% for extended strike action. HEC voted to initiate an industrial action ballot from August through September ending in early October. A pay campaign over pay casualisation, pay inequality and workloads has the potential to galvanise the membership across both pre- and post-92 universities. This is a record turnout for an e-consultation on pay for the union. The strength of feeling over these issues can be gauged by the report that only one branch in the whole of the UK (a very small branch in a university where UCU does not have recognition agreement) voted to accept the offer. While real ballots result in higher turnouts, and despite such a high vote in the e-consultation, there is a need to avoid complacency and instead work to ensure branches mobilise around the Get the Vote Out Campaign. Debate at HEC ensured that the ballot will not start until the end of August and continue into October with escalating and sustained strike action in November unless there is a major improvement in the pay offer being made. Pay briefing meetings in the devolved nations and regions with a Special HE Sector Conference in September are also being planned. UCU has agreed to timetable a Special HESC when the JEP reports, which will be empowered to take the dispute forwards. It is possible that not a lot will happen over the summer. And in practice the Special HESC can vote to reinstate a proper dispute committee (see section on democracy below), composed proportionate to branch size and with voting and decision-making capacities, at that time. The latest statement from the JEP can be found here. A motion on casualised pension rights was discussed by HEC. The discussion reflected the increasing profile of casualised issues within UCU. The success of the USS dispute particularly helped to raise the wider issues of marketisation, equalities, and casualisation and to galvanise members on picket lines and in teach outs. An obvious disparity highlighted by the USS fight is that many casualised members and lower paid permanent members cannot access pension rights or cannot afford to pay for pensions. Added to this their contributions are often recorded inaccurately or there are gaps. They often work in two or more institutions across the sectors and can rarely afford to retire. Yet they stood in solidarity with their permanent colleagues fighting for a different kind of higher education system. Now casualised members are calling for union wide solidarity and a resolve from their UCU brothers and sisters to fight for pension rights for workers on all types of contracts in both sectors. This motion sought to get this issue on the table and for a union wide conversation to be had on pension rights for casualised workers. Though it was agreed that welfare benefits are also an important issue we resolved to focus on pension rights. HEC agreed to ask the Education committee to table a speaker on casualisation and pensions at the Cradle to Grave conference; that there would be a meeting held ACC would discuss pension provision across HE and that we would do some work, with resources, to enable UCU to provide specialist guidance to branches. This was supported by the whole HEC and passed unanimously. Practical proposals for implementing a sector conference motion on military and industrial research: there is increasing pressure to get research funding and concerns by many members about ethical issues. Victimisation of striking members in the USS dispute; one of the remitted motions from the recent sector conference and there is great concern by the branch. UCU has transformed. We cannot allow victimisation. Resisting the far right and supporting Black and ethnic minority students, motivated by a Black member pointing out the serious discrimination experienced by Black PhD students. UUK visit to Egypt, motivated by discussion on the activists’ list and concern that links with other countries need to be ethical and UUK did nothing when Guilio Regeni was tortured and murdered. Funding UCU casualised workers to attend a joint union training and funding a banner and placards for a joint union anti-casualisation march. This is motivated by the experiences of casualised workers and would be important in supporting our pay campaign and making other unions aware of the particular experiences of casualised workers in HE and FE. Important papers on precarious work and workload were presented, but there was no time for discussion. Equally important papers on the rate for the job and how sector conference motions will be implemented were not even presented. Both HEC and NEC are experiencing serious problems in getting through the agenda. Members’ motions regularly fall of the agenda. As indicated above, these are often vitally important issues which are brought by NEC members, often in response to concerns from branches. They are therefore part of how elected members are accountable and respond to grassroots concerns. There are views that this is deliberate. Whether or not this is the case, it is of the utmost importance to ensure this does not happen in the future. Positive changes could include moving members’ motions much earlier in the agenda, limiting the number of speakers on an issue (on a for and against basis, as at Congress, and possibly also neither) and providing a written list of the items motions are assigned to rather than spend half an hour discussing this. Another frustrating day saw the dead weight of the majority HEC members around the so-called ‘Independent Broad Left’ (IBL) and bureaucracy trying to overturn Higher Education Sector Conference (HESC) decisions on transparency and democracy. The right wing of the HEC (IBL) decided that the HESC motion which called for the setting up of a national strike/dispute committee with representatives elected on the same basis as the HESC formula (so retaining proportionality to branch size) really meant that HESC delegates should elect a subset of their number as the dispute committee. 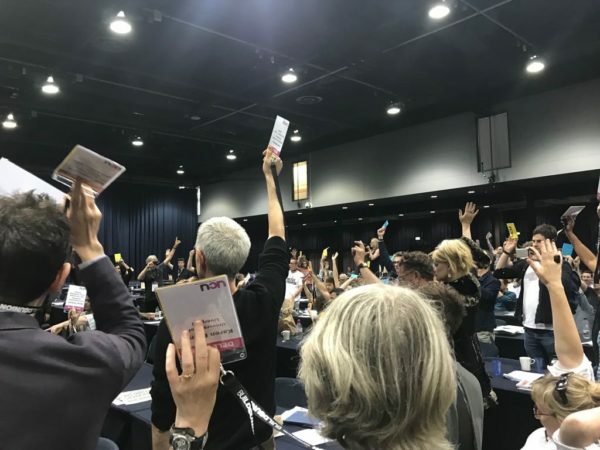 The entire motion was written because of defects of Branch Consultation Meetings which had no standing in the union rules, and no voting powers. These defects were made explicit for the entire union to see on March 23rd 2018, when infamously no vote was taken on putting the UUK offer to members. As a result members are still arguing about what different branches’ positions were on that day. The solution, enshrined in motion HE13 (copied in the Appendix below), was a voting assembly of members proportionate to branch size. This is the same method for electing delegates to the Higher Education Sector Conference, which is enshrined in rules. The idea was to duplicate that structure, but eliminate some of the bureaucractic encumberances. The IBL voted against this and argued that “composed of” did not mean “composed of all”. The IBL did this because the last two HESCs have voted overwhelmingly for motions that the IBL do not approve of. Members voted for transparency and accountability of the JEP, but also of the union’s structures. They argued for more democracy not less. HE13 Composite: USS dispute: national dispute committee – University College London, Goldsmiths University of London. while some aspects of negotiations are confidential, to maintain a sense of ownership of the dispute among the membership and to maintain members’ resolve to take industrial action, members must know how negotiations are progressing. HESC resolves to establish a national USS dispute committee composed of HESC delegates (or substitutes) from USS branches, to which national negotiators and UCU Independent Expert Panel members will report. This committee will meet at regular intervals until the dispute is officially terminated and will give a representative steer to the dispute for the current valuation round, including during any suspension or re-ballot.